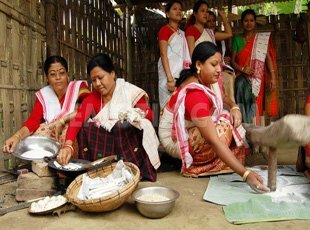 Magh Bihu, or Bhogali Bihu is a very auspicious festival, and is celebrated by the people of Assam on the ending day of Harvesting crops season, and it is another way of enjoying the day in Maagh (January-Feburary). The celebrations last for a week, and are reveled by the communities around the state, with variety of delicious food, and dancing around bofires. The eve is not as different to Lohri, which is celebrated in Punjab and other parts of North India, even though there are different traditions and activities that are performed during the festivities. The young people in the community build Meji and Bhelaghar, which are creative huts that are made from bamboo, leages and thatch. They are often painted over, and adorned with flowers and other decorative things to make them more beautiful. The feast is eaten in the Bhelaghar, which is then burned the next morning. There are also a variety of games that are played by the people, like buffalo fighting, in which men try to tackle and control a buffalo themselves. Such practices are often done in the supervision of a large crowd and men do injure themselves during it. Tekeli Bhonga, or pot breaking is another fun activity that is enjoyed by the people during the festival. One of the most delicious food that is made on the festival is “Pitha” which is made of rice and comes in a lot of varities, like Shunga Pitha, Til Pitha etc. Pitha’s are also thrown in the fire, when the Bhelaghar is burned. They’re thankful to the god of fire, and pray for a good and fulfilling year, and take the remaining, charred parts of the wood from the Behlaghar. The celebrations are very important to the people of Assam and are energetically performed by them.